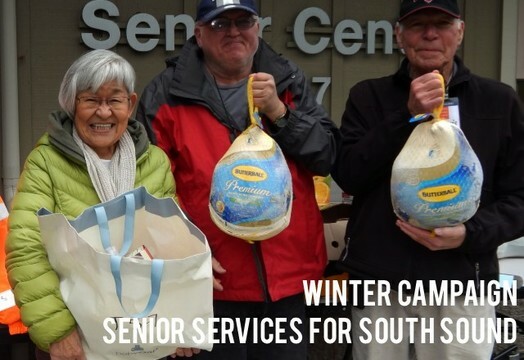 Improving the Lives of Seniors - Senior Services for South Sound | CommitChange | We help organizations raise more money, more sustainably. Will you make a donation to continue to improve the lives of seniors? We are grateful for the giving that happens in our community all year round. It is at this time of year, our coldest months, that we see the true power of your generosity. Every year during the third week of November the annual Thanksgiving meal happens for our homebound Meals On Wheels clients and seniors at the eight community dining sites in Mason and Thurston counties. In total, your donations allowed us to cook 50 turkeys to feed over 750 seniors on that day. After the Thanksgiving meal, we partnered with the foodbank to distribute turkeys and goods for side dishes to the seniors at the Olympia and Lacey Senior Centers. These elders couldn't afford this meal on their own. We heard from one senior, Judy, who was thrilled to be given the holiday fare and plans to cook for and host her younger single neighbor who is far from home.